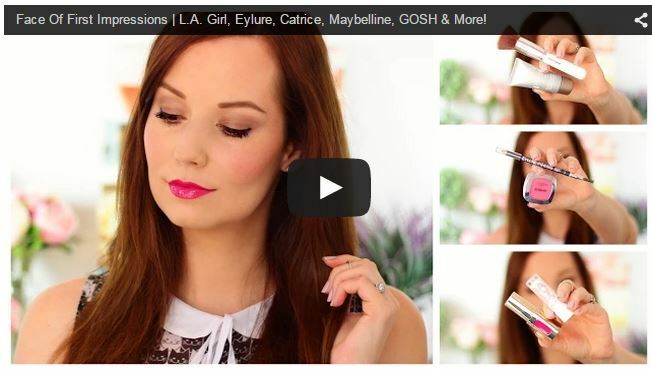 Face Of First Impressions – Eylure, L’Oréal, GOSH, L.A. Girl, Kandy Kane Brushes, Maybelline & More! Today is a very special day for me – 3 wonderful years ago Neal and I got married. 25 February 2012 is by far the best day of my entire life and I thank my lucky stars that I was able to meet someone as loving & supportive as Neal. We’ll be celebrating by going out to dinner at my favourite restaurant (Kream) and I think I’ll have a glass (or two) of bubbly! A few weeks ago I was going through all the new makeup products in my collection and was trying to think of a way to include ONLY brand new products in a YouTube video. I initially thought of doing a normal ‘First Impressions’ video but then the idea came to me to apply the products for the very first time, on camera. So a type of makeup tutorial, but also a talk-through first impressions video. Filming this video was extremely challenging for me, because I had no idea whether the products would work well in general (not to mention whether the shades would suit my skin tone). Also, talking to a camera while applying the products & trying to make sense in explaining why you like / dislike an item, is not as simple & easy as it may sound. Every single makeup product reviewed in this video is brand new to me, I had never tested or even swatched the shades prior to filming the video. I feature everything from primer to lippie, so make sure you watch till the end (even if it is to hear my tummy make a very loud rumbling sound – haha!). I am also very excited to be featuring a few Kandy Kane makeup brushes, they are super affordable brushes sold by the beautiful South African beauty blogger Marlize. One thing that I definitely want to mention about the concealer, is that it really irritated my eyes. I have been walking around with a dark cloud hovering over my head, because I’ve been suffering from dry, swollen and bloodshot eyes since Sunday (when I filmed the video) – not pleasant. My eyes are quite sensitive to start off with, but the concealer took it to a whole ‘nother level. You can clearly see at the beginning of the video that my eyes are very red, I almost didn’t publish the video because I felt so embarassed! It could also be the eyeshadow palette but I think it’s the concealer. I did a bit of research last night and it seems the Clinique Even Better Concealer is suitable for the under eye area BUT it contains Vitamin C which helps to brighten dark spots on the skin over a period of time. I think the Vitamin C caused the sensitivity and irritation. I’m going to try use the concealer on only hyperpigmentation areas from now on and will let you know how it goes (but will keep it very far away from my eye area). I will also use it to clean up around my lips after applying a bold lip product, I find clean-up is a MUST when wearing a dark or red lippie. Please remember to share the video with your friends (but only if you enjoyed it) – it really helps to get my videos out there for people to see. You can also subscribe to my YouTube channel here, this means you will always be kept up to date on all my new videos. 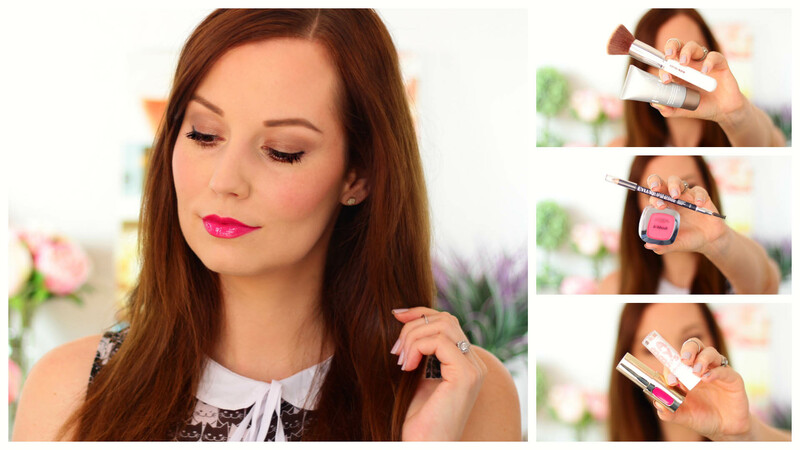 I am including a list of the makeup products reviewed in the video below, I won’t say too much about each product in this blog post as it’s best to see me apply them & hearing what I love / don’t love about them. ♥ Dermalogica – Dermalogica Concept Stores, Sorbet salons & selected beauty salons. ♥ BioNike – Dis-Chem stores & Dis-Chem online store. ♥ Clinique – Edgars, Red Square, Foschini & Truworths stores (not available in the Clinique online store). ♥ Maybelline – Clicks, Dis-Chem and Foschini stores (won’t be available at Edgars stores) & Dis-Chem online store. ♥ Catrice – Spree, Dis-Chem stores & Dis-Chem online store. ♥ Rubi Cosmetics – selected Cotton On stores. ♥ L’Oréal – Spree, Clicks, Dis-Chem, Foschini & Edgars stores & Dis-Chem online store. ♥ Eylure – Dis-Chem stores & Dis-Chem online store. ♥ GOSH – Edgars & Red Square stores. ♥ Essence – Spree, Clicks, Dis-Chem stores and Dis-Chem online store. ♥ L.A. Girl – Dis-Chem stores and Dis-Chem online store. Next video is going to be a HAUL video, I have loads of new goodies to show you – even a dry conditioner… Yep, you heard me…not a dry shampoo, a DRY CONDITIONER! I enjoyed this video a lot! Do you think the primer is worth the money? EEEK…seeing the morgan taylor nail polishes and I realise I have not gone to look for them yet. Must get it soon! Your nails looked great in the video as usual. Do you always do your own nails? So perfect! Yes, I would definitely recommend the primer to anyone who suffers from redness or Rosacea. The original Dermalogica primer is a definite favourite & I would suggest it to those who can spend a bit of extra money on a high-end brand. Oh and HAPPY ANNIVERSARY!! I am sure you’re going to have an awesome day! Neal sounds like a gem so I’m sure he will be spoiling you rotten 🙂 Enjoy the bubbly….only 24 more weeks until I can gulp a bottle down myself. lol. Thank you, Simone! 🙂 He’s such a keeper! Dinner was fab, thanks. Loved the video! Your stomach rumble was so funny!! HAPPY ANNIVERSARY TO NEAL & LUZANNE! Thank you, Estee. My eyes are feeling so much better, I used Prefrin eye drops and tried to only apply makeup when I REALLY had to. Your video was amazing. If you were struggling with anything it didnt show – not even for a second You were so cool and calm and professional. My tummy rumbles often lol even when Im not hungry haha and your tummy rumbling so funny but normal. I like the first impressions videos!!!!!!! I would love to try the Dermologica Redness Relief as I suffer from rosacea 🙁 and the redness is so embarassing because it permanently looks red / flushed / blushing…. So as Simone asked is this primer worth the R630? The original Dermalogica primer is probably my favourite primer of all time. After using this Redness Relief primer in the video last week Sunday, I’ve been using it non-stop. I don’t notice a huge difference in the redness on my cheeks (it looks less angry & flushed), it’s almost like a subtle veil. I would recommend it to someone who struggles with Rosacea as it will help to calm and soothe the skin, plus prep your skin for foundation application. It can also be worn alone (without a foundation on top), the SPF20 will protect your skin against UV rays. MUST get that blush, wow!! Loved the video, do more of these please? I suffer from Rosacea and will definitely be investing in that Dermalogica primer, luv that it also soothes the skin. Will definitely do more of them, just need to accumulate enough products to be able to do a full face of makeup (so it might not be very often). @Kelly M…. What are you currently using for your Rosacea? Face wash, cleanser, mosturiser etc etc. what has worked for you and what has not? Im also suffering from rosacea. I’m sure you know this already, Missy, but try to steer clear of anything that contains colourants or fragrances. Are you looking for affordable products or are you willing to invest in more high-end brands? hey Luzanne, quite frankly i will try any product that i know is definitely going to work. I would appreciate if you can suggest both affordable and high end products that you know are great for rosacea. HAPPY ANNIVERSARY 🙂 I always enjoy your videos and always learn something new everytime I watch one. Bitter opgewonde oor daardie haul post…kom loer elke dag twee keer of dit nie al op is nie!